Rainy or sunny, its always nice to chill out after work. Popped by to DoubleTree by Hilton last week to check out their new dinner concept Bring Me Food @ Tosca. Arrived early to chill a wee before dinner. 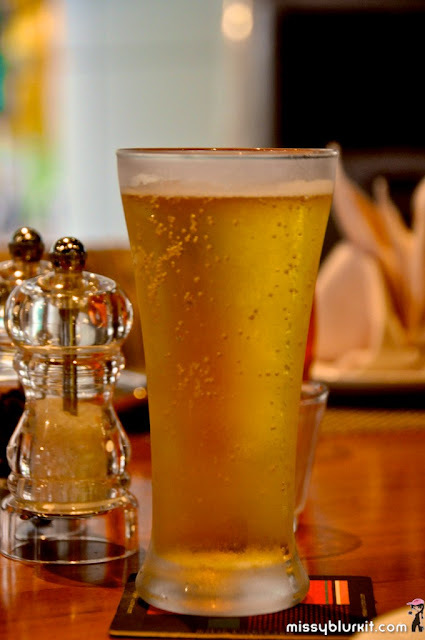 A glass of cold beer by the pool @ Tosca is a brilliant way to unwind. Opt for wine, cocktails, mocktails, juices...whatever that tickles your fancy. 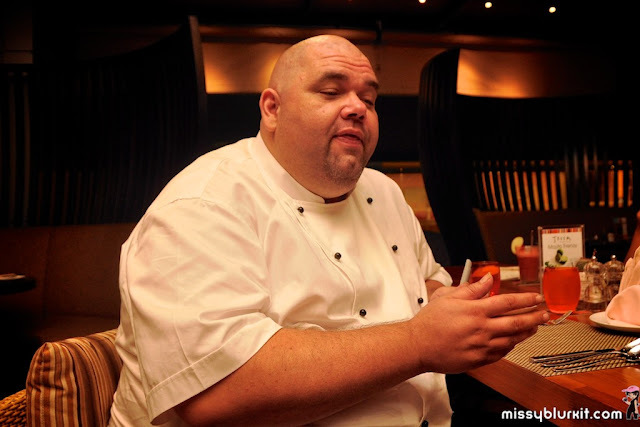 Helming Tosca is Michelin Guide accredited guest Chef Andrew Blundy. A big and cheerful bloke, do catch this Chef and allow him to fill you with his stories and experiences. Of course, do allow him the time to work with his team to churn out yummies for you too. A chef who looks like a chef! No harm having a bottle of wine with your dinner. 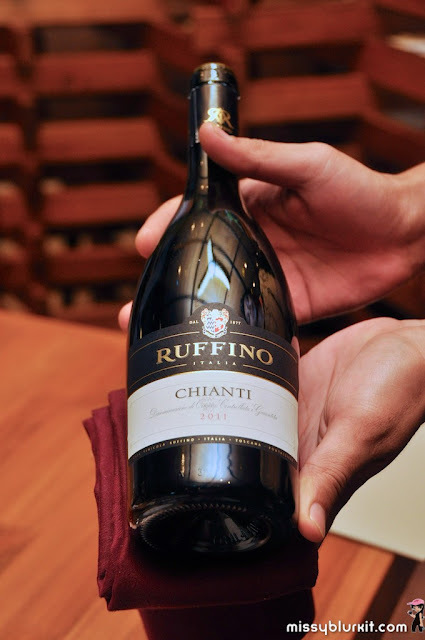 We opted for an Italian red Ruffino Chianti 2011. Easy drinking and it paired well with both red and white meat. Perfect with the fish too. 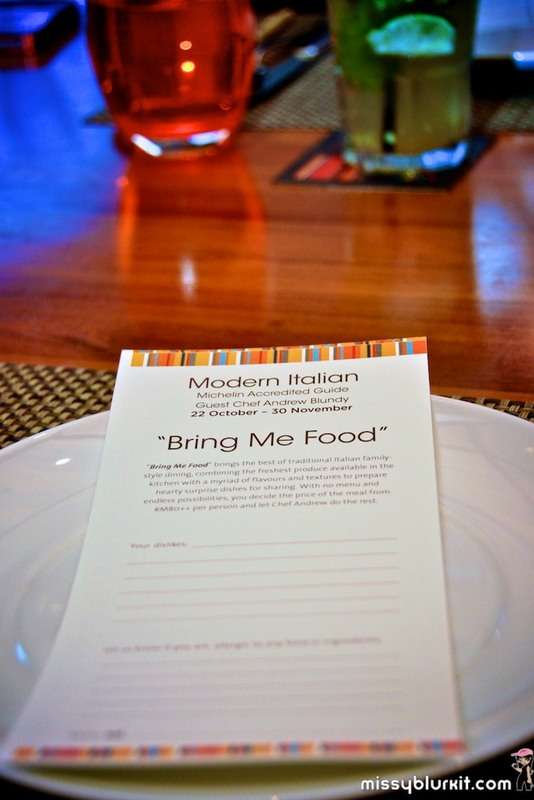 Bring Me Food is serves dishes for sharing amongst your dining companions. This is similar to the traditional family-style dining in Italy. And of course, the lil surprises in stored for you uses only the freshest ingredients available in the kitchen on the very dining day. For RM150++ per pax, the following was our dinner. Starting one's dinner with a warm soup is always my preference. 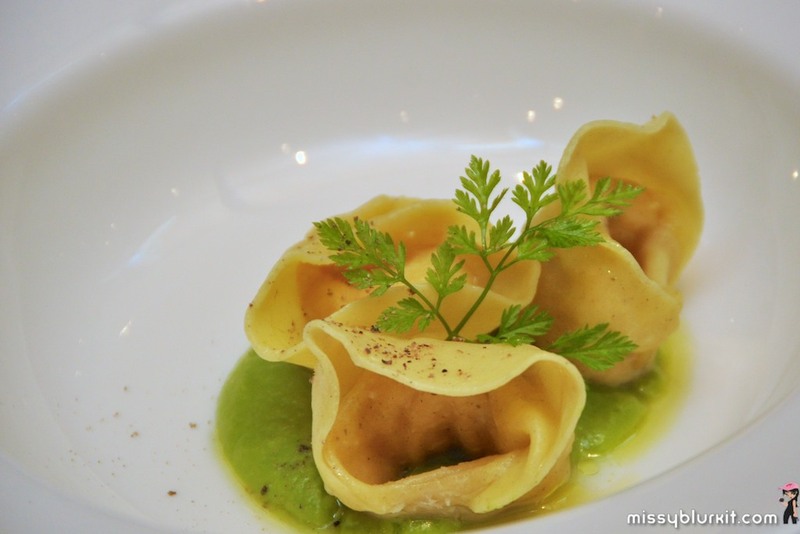 Chef Andrew Blundy served us Tortellini in Brado RM28. Pretty Tortellinis on a bed of green peas puree. But where's the soup? Patience...and the Egg Broth will be poured right before us. 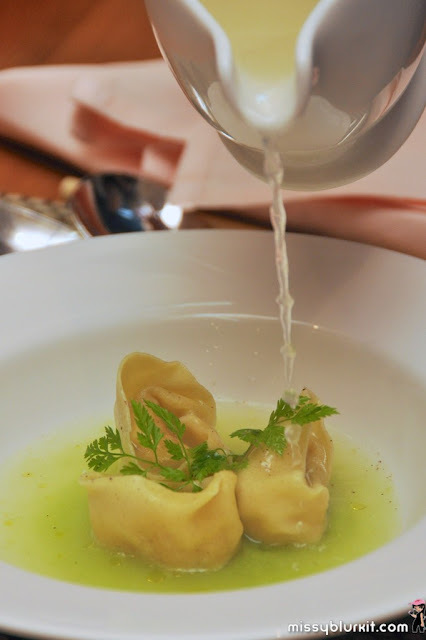 This ensure the tortellinis remain firm. 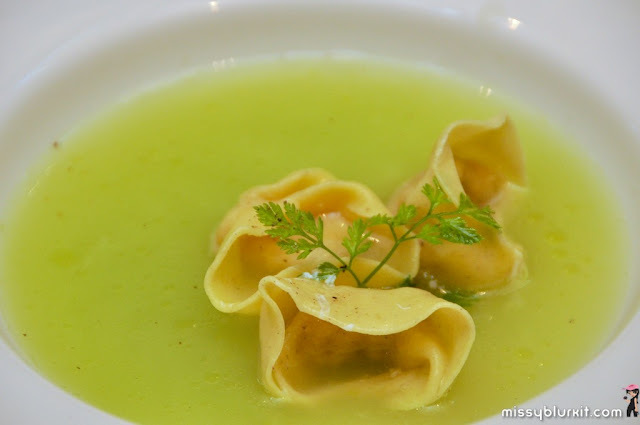 The broth is clear and light, complimenting the chicken tortellinis perfectly. Insalata Nizzarda in Modo Nuovo RM32. Nicoise Salad with Tuna Tartare and Mollet Quail Eggs is quite a pretty dish. 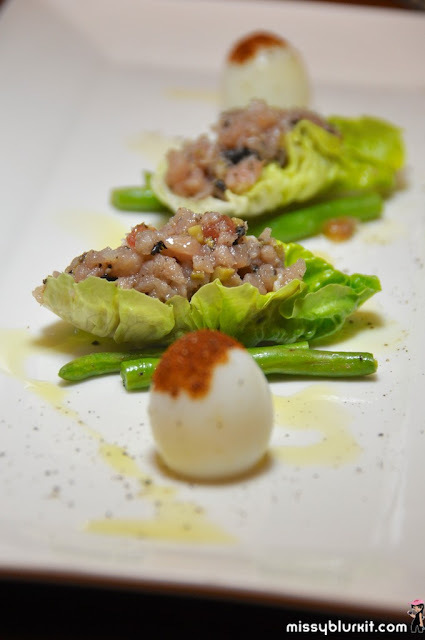 Petite quail eggs served with a delightful mouthful of tuna tartare on a crisp lettuce. Insalata di pancetta di manzo e quaglia con noce RM34. Beef bacon salad...normal! Having a beef bacon salad with quail wings were new to me. 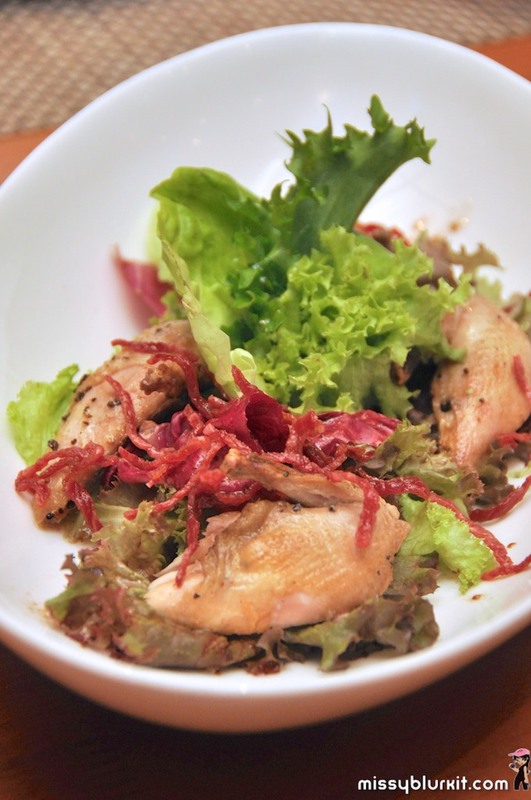 The tender quail certainly added lots of character and taste to a common salad. Chef Andrew Blundy thought we had a hungry look or we all certainly looked hungry on that rainy evening. We had 3 pizzas and 1 lasagna to fill us up. 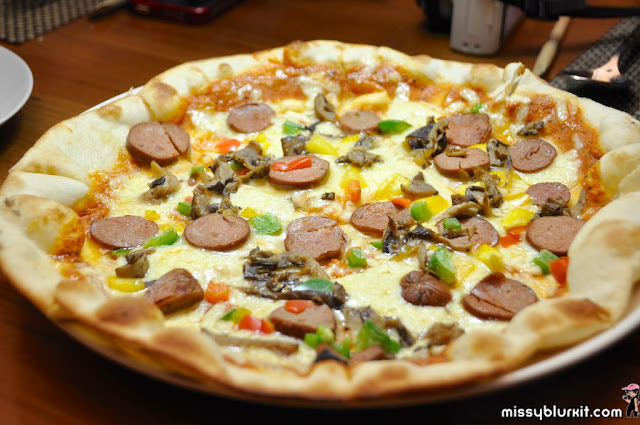 Air dried beef, pepperoni and roasted onions RM36 is a brilliant choice for meat lovers. Thin and crisp crust the ways I love my pizzas. 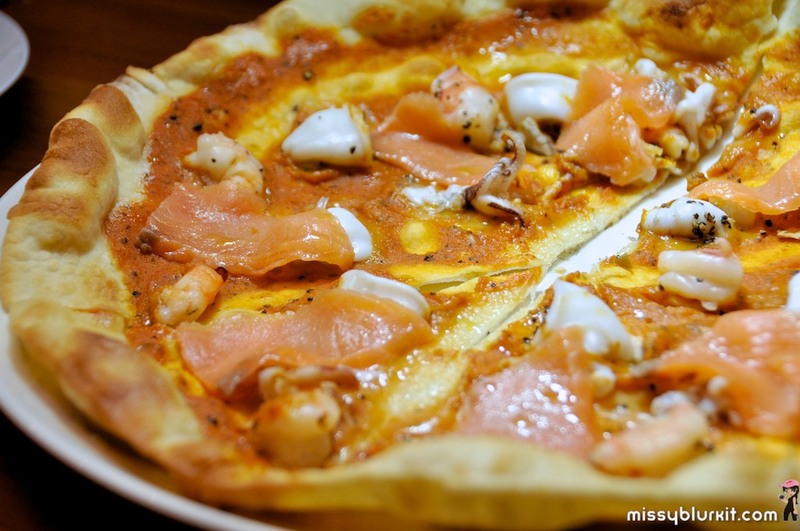 Smoked salmon, calamari and clams pizza RM36. Cheese free because someone on our table doesn't not quite like cheese. That's the chef taking note of your likes and dislikes! 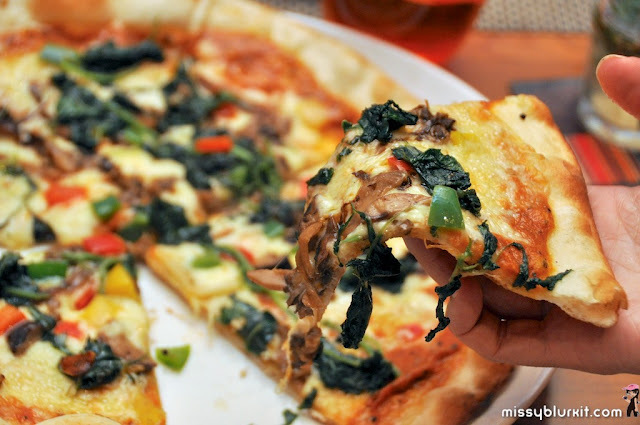 Capsicum, mushroom and spinach pizza RM36. This is my fave of the 3. Absolutely tasty with the generous topping of cheese and spinach which are brilliant accompaniment to each other. 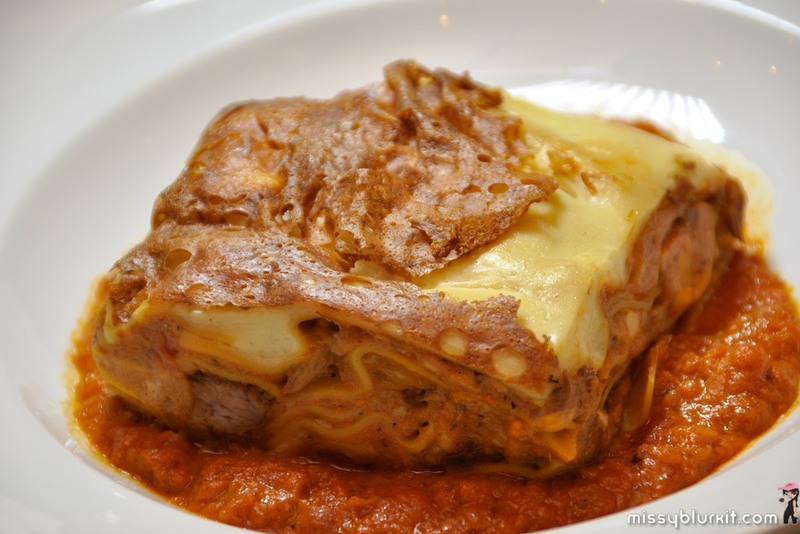 Lasagna al forno RM42 is a comforting lasagna with one of the tastiest beef ragout possible. 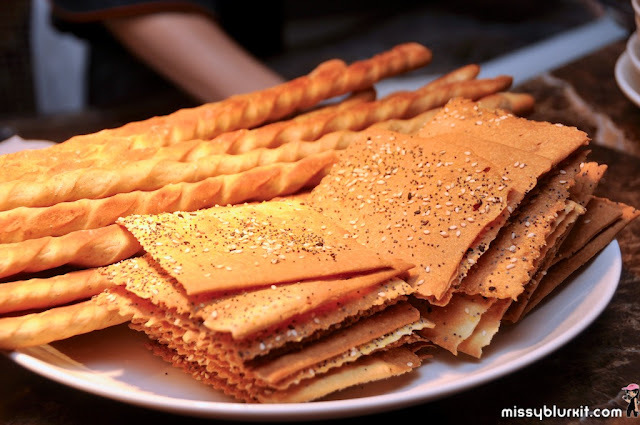 Cheesy, tangy and meaty in every mouthful. And just when you think the 3 pizzas and 1 lasagna were the mains, we were in for a surprised. There was 2 mains of fish and lamb. Branzino saltimbocca RM46. 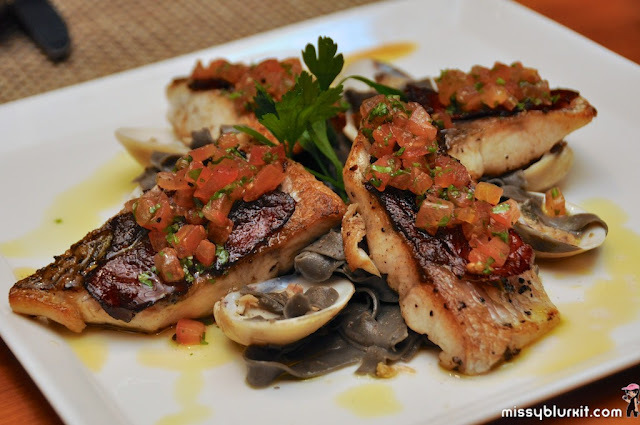 Saltimbocca of Seabass with squid ink tagliatelle, clams and tomato topped with coriander salsa. I can't complain...I've always loved squid ink pastas. A perfect seafood pasta bursting with flavours of the seafood and given an extra punch with the tomato and coriander salsa. Stinco d'agnello brasato "osso bucco" RM52. 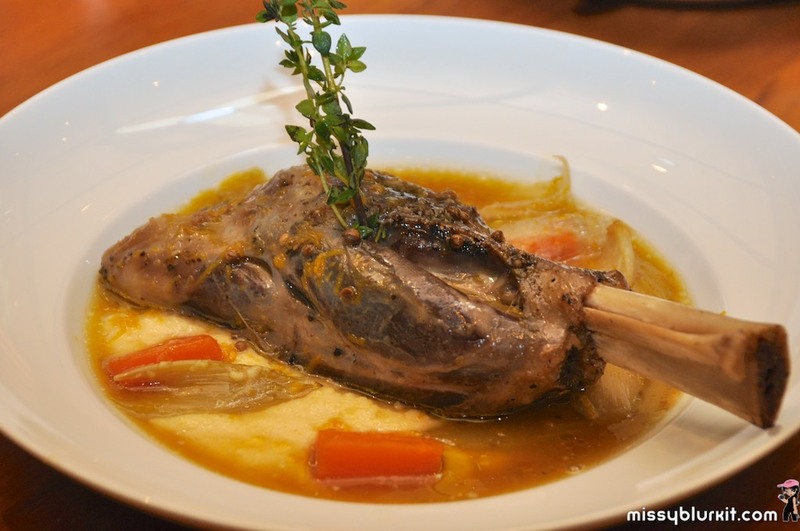 Perfectly braised lamb shank "Osso Bucco" style with braised vegetables and polenta that makes this a wholesome meal on its own. The lamb was superbly tender and fell off the bone with little resistance. 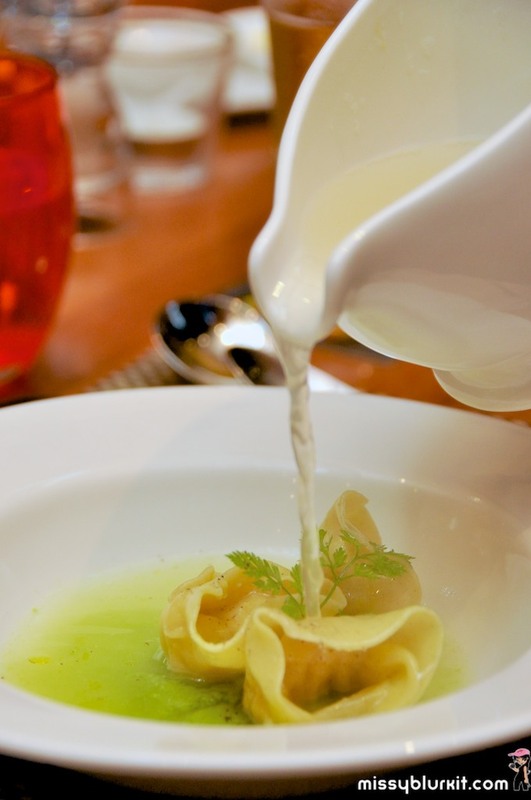 This is also apparently Chef Andrew Blundy's comfort and fave dish! Eat your vegetables. 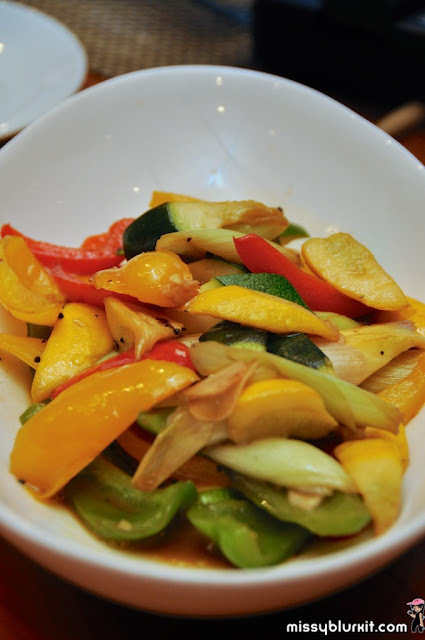 Roasted vegetables RM25 to accompany our mains. Its a sin not to have any desserts in an Italian meal. That's my take at Italian meals! Dessert was a pretty platter of 3 items - Semifreddo di nocciola e cioccolato RM26, Italian Cassata RM26 and Limoncello panna cotta e gelatin RM26. 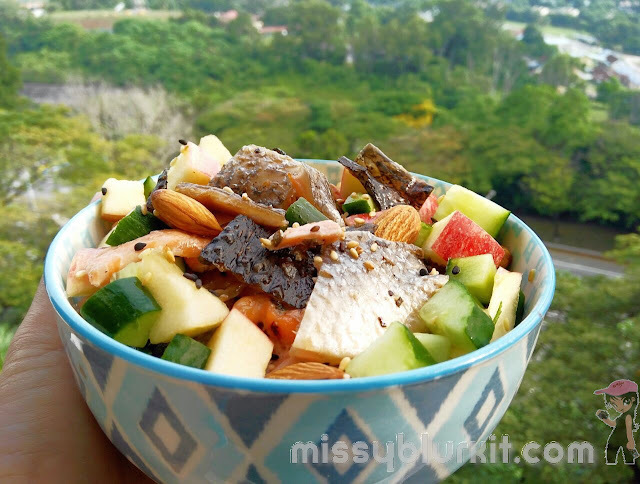 3 different taste and textures to pamper our tastebuds. I started off with the Italian cassata (right) which was a delicate dessert made of layers of ice cream with dried fruits, sponge cake and whipped cream. Rich and decadent! Moved on to the left which was Semifreddo di nocciola e cioccolato. I love hazelnuts as a general rule and any dessert with them is bound to score top points from me. 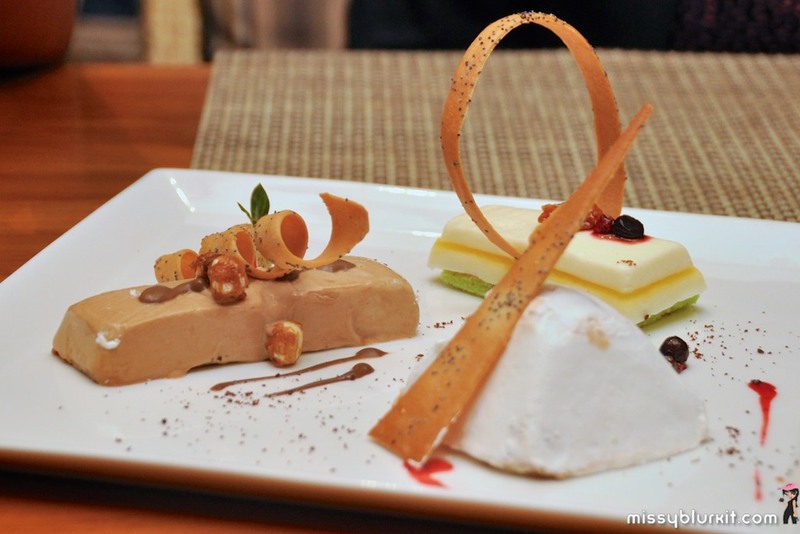 Semi frozen chocolate, hazelnut and cheese in an ice cream. No complains! To finish of with the Limoncello panna cotta e gelatin is only natural. Refreshing limoncello milk custard and jelly made even yummier and refreshing with the berries stew. Chef Andrew...may I have more berries stew when I come visit you next week? 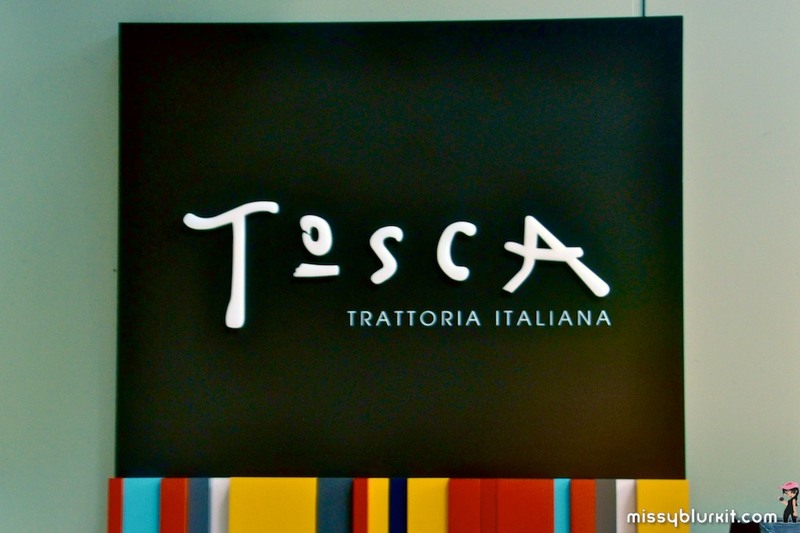 Bring Me Food at Tosca goes on till 30th November 2012. Make it a point to drop by for dinner and have fun with the surprises that Chef Andrew Blundy and his team have for you. Meanwhile...for every RM350 spent at Tosca for this food promotion, you will be an entitled to one entry of an ongoing contest that offers a Grand Prize of a return flight ticket for 2 to Milan via Etihad Airways and a 3D 2N stay at DoubleTree by Hilton, Milan. Good luck folks!